Our biggest science focus this year has been chemistry – and we’ve spent a significant amount of time exploring everything from its history – researching the early alchemists – to the periodic table, visiting the Chemical Heritage Foundation’s museum, and so on. Lately, Sarah has been on a quest to learn more about atoms and elements and how they really work. She is fascinated by the fact that there are bazillions of molecules in a raindrop and routinely brings that up in dinner conversations. We read, we play games, and we watch TV with an eye for the chemistry involved. 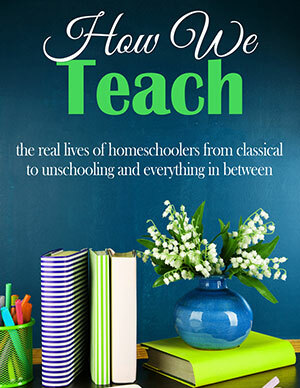 And today, I want to share some of the many ways we’ve compiled to explore this subject in our unschooling, not-usually-very-subject-based-at-all home! 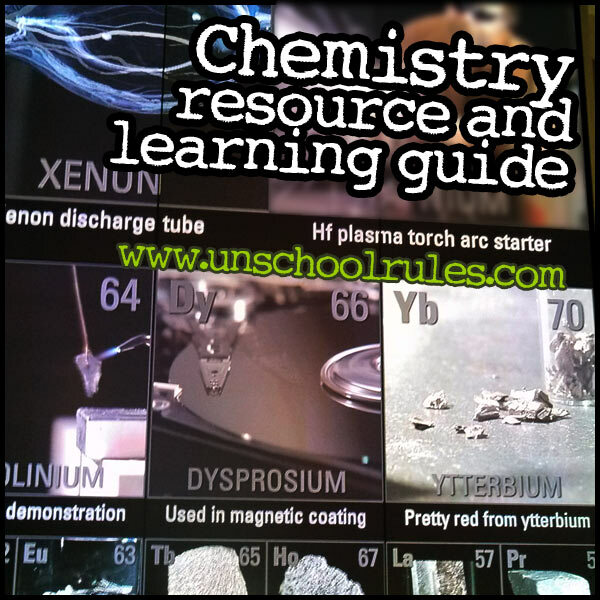 While most of the items on our chemistry resource guide are tailored toward an upper-middle-grade or high-school-aged student, there are ways to adapt almost all of them. Some of these are resources we’ve used for several years and could easily be adapted for younger students; others are even now pretty complex and require me to really play an active role in “translating” them for Sarah. Even more than many other topics we’ve learned about, this has been one that we’ve really tackled together, and it’s great! Sarah having a good time (and just being weird) with an experiment. I’m mentioning this separately (even though I’ll share a ton more online resources below) because of how awesome it is. Longtime readers know I’m a huge fan of taking free online college courses via Coursera, so when I saw that there are many chemistry courses available, I was thrilled!. If you’re new to Coursera, I’m glad to help you with anything related to getting registered and navigating the course; I’d also just love to compare notes with other unschoolers going through their courses! The Disappearing Spoon: This book is a FUN read on some chemical and elemental trivia and miscellany. I’m reading it and sharing interesting tidbits with Sarah as I go. Among other things, the title? It refers to a prank involving chemists, Gallium, and tea – and the spoon really does disappear! The Illustrated Guide to Home Chemistry Experiments – All Lab, No Lecture: Sarah received this book as a Christmas gift, and it’s fantastic. (Thank you, Aunt Adriane!) 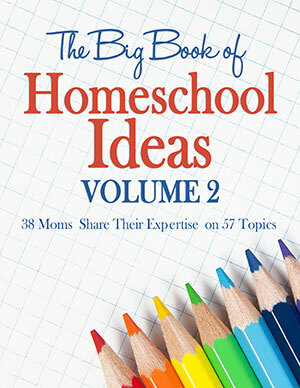 It is full of serious experiments, not baking-soda-and-vinegar volcanoes, designed to cover as much as several high-school or beginning college lab courses might, and it’s designed specifically to be used at home, though getting all the required supplies to do the full set might be costly! Why Is Milk White? & 200 Other Curious Chemistry Questions: Now THIS is fun. Written by a chemist and his curious 11-year-old neighbor, and presented as answers to a series of questions you’d really ask. You know, like why is milk white? How does superglue work? We’ve been jumping around in our Kindle version of this and having a great time with it. DK Eyewitness Books Chemistry: This is one we’d requested from our local library because of how much we’ve always loved the Eyewitness Books series! While this is slightly more elementary in some ways than Sarah’s level, it’s full of fun facts that have led her to explore more. We highly recommend this for upper-elementary and lower-middle-school-aged students especially. The Cartoon Guide to Chemistry: This is one that we actually don’t yet have, but it’s high on our wishlist – a comic-style illustrated historical AND scientific look at our favorite subject. The Elements, A Visual Exploration of Every Known Atom in the Universe: We have been eyeing this up ever since seeing many of this “visual explorations” on our trip to the Chemical Heritage Foundation Museum early in 2013, and I think we’ll finally be getting a copy with some Amazon giftcards we got for Christmas. It’s exactly as described – a beautiful photographic journey, including some phenomenal microscope photography, about all of the elements. Super-cool. Chemistry sets: Can I be honest? I don’t really like most chemistry sets presently sold. The lab equipment is generally low-grade, the “chemicals” included could be purchased in most grocery stores, and the experiments aren’t particularly exciting. We were lucky enough to pick up an OLD version of a current set at the local curriculum fair, but I don’t recommend the version you can buy new. If I had the money, I’d have pledged $900 to a Kickstarter campaign from a few years ago for Heirloom Chemistry Sets by H.M.S. Beagle, which is really the first kit I’ve seen in a long time that I loved. (Alas, no $900 was forthcoming, so we don’t have one!) If you have a set you recommend, please comment and let me know, and I’ll be glad to add a link, but for now, the best I can say is, get the nicest one you can and be prepared to supplement, or be willing to assemble things on your own! Flasks: Sarah is probably the only 13-year-old I know who was excited to get a set of five Ehrlenmeyer flasks for Christmas. If I can make one suggestion about something to spend money on, over and above a solid chemistry set and basic text, please, make it good glassware! Especially if you’re working with “real” chemicals, it’s best to have something of quality. Beakers: More glassware. If you’re wondering, a beaker has a wide mouth; a flask has a narrow mouth. Both are good for various kinds of experiments, and good beakers are next on our list to get! Full glassware kit: Hit the lottery, have six kids (or a co-op) who need to learn chemistry, or just really like it? This 95-piece full glassware set is super-nice and will take care of absolutely any home chemist’s needs. Periodic Table Playing Cards: These are actual playing cards (a set of two decks, with jokers) that happen to feature facts about the elements instead of ridiculous designs. (Even including the name of each element in French and Spanish, as well as the standard periodic table information.) Play and learn? Win/win! MythBusters: Sarah has been a huge MythBusters fan since we picked up our Netflix subscription early in 2013. We’ve learned a ton from this show – some of it relating to physics, but some of Sarah’s favorites most closely relate to things like the chemistry of Diet Coke and Mentos, the chemical reactions alcohol consumption produces, and more. Star Trek: This is absolutely Sarah’s passion right now, and I admit that I wouldn’t have immediately tied it to her interest in learning more about chemistry. But the more we’ve watched and read, the more it’s amazing to talk about the reality and the fiction used in the various series – from the ridiculous “science” in the original TV series to some pretty high-tech and plausible stuff in the new movie reboots. How could planets be made habitable for humans? What kinds of chemical changes on a planet’s surface cause massive crises that the Enterprise crew needs to address? Watch this and look for chances to talk about chemistry, and you might be amazed. Breaking Bad: OK, maybe you don’t want your elementary-schooler watching this. Sarah, however, will tell you matter-of-factly: “They make meth. Making drugs is a kind of chemistry too.” Lest you think we’re encouraging that, please know she is aware it is not a good kind of chemistry. And while we’ve actually never seen more than a couple episodes all the way through, seeing references to Breaking Bad come up in pop culture has given us a seriously good chance to talk about the ways – good and bad – that science can be used. You’ll Get an A in Chemistry is a parody by some chem students of One Direction’s What Makes You Beautiful. Finally, two of my favorites are Why Does the Sun Shine? and Meet the Elements, both by They Might Be Giants, one of the most awesome bands ever for kids and grownups. The Chemical Heritage Foundation Museum: We’re incredibly lucky to have visited this Philadelphia museum earlier this year. 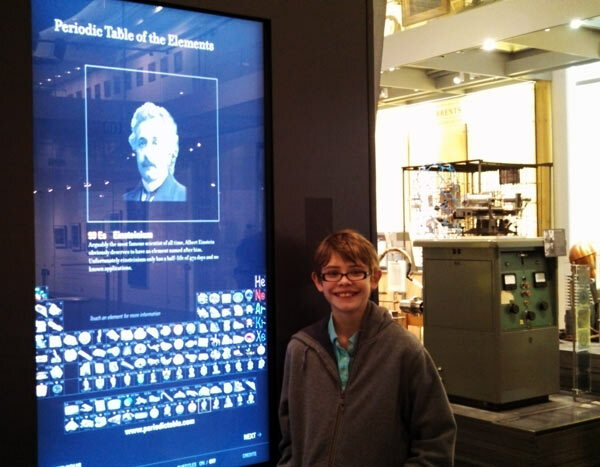 They have a wonderful museum with an incredible (and HUGE) digital periodic table, exhibits depicting chemistry from its roots in alchemy to modern research, and more. The Koshland Science Museum: This museum in Washington, D.C., is on our to-visit list (a simple day trip for us). It’s an interactive science experience targeted specifically at teens, part of the National Academy of Sciences. The Museum of Science and Industry: This science museum in Chicago specifically features a lot of chemistry-heavy exhibits – and, in fact, a lot of cool stuff overall, as it’s the largest science museum in the Western Hemisphere! Sarah at the Chemical Heritage Foundation Museum in Philadelphia in early 2013. Their interactive periodic table is amazing! FREE! GoReact is an amazing free app available for iPad, iPhone and Android, though I admit I like it much better on our tablet than our smaller screens. It was produced by the Museum of Science and Industry in Chicago and shows you what elements react – and what they make. It’s pretty amazing; we can play it for an hour easily! FREE! Nova Elements (iPad): This app is a little more advanced, but you can build each element of the periodic table by inserting the right number of protons, neutrons and electrons, then build molecules of all sorts, plus watch amazing videos. It’s incredible! FREE! Periodic Table (Android): A winner on Android, this app includes a fun quiz function plus YouTube videos of chemistry terms. There are also a bunch of FREE periodic table viewers with varying levels of complexity. Some of them include EMD PTE, iElements (iPad and iPhone), The Periodic Table HD (iPad) and the K12 Periodic Table of the Elements (iPad and iPhone). One premium app is Periodic Table+ (iPad, $1.99) – though it also has a lite version for free. Khan Academy is a great go-to for tons of science topics, with chemistry no exception. Their first-year chemistry course is incredibly detailed, and we’ve picked pieces out of it to watch here and there. There’s also an advanced organic chemistry that would work for higher-level students! Dynamic Periodic Table … pretty much what you’d think. A periodic table where you can click to read more about each element. A great resource. Periodic Table of Videos is a YouTube channel full of crazy looks at fun chemistry questions, like “What if ice did not float?” as well as profiles on various elements, complete with experiments. BBC’s Volatile History of Chemistry allows you to watch a three-part documentary series on chemistry history. It’s fascinating stuff – not always told from a worldview I support, but still interesting! The Modern Alchemist (also known as Dr. Peter Wothers) is offered by the Royal Institution of London and is amazing. These video lectures (actually amazing video experiments) are well worth watching. Printable periodic table and element resources from FiveJs.com includes a full-color table you can print, plus blanks and partial blanks to help you fill in what goes where! 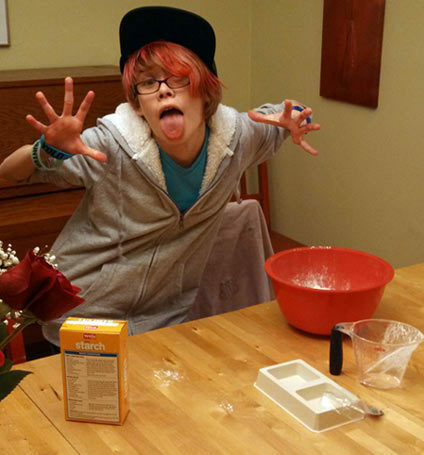 My friend Phyllis of All Things Beautiful is studying chemistry with her family this year, too, and she’s got a wide variety of resources – including recipes for making your own slime, gak and more! Have you studied chemistry? Any ideas for good resources? Please comment and share; I’d love to add them to the list! If you found this resource guide helpful, I hope you’ll check out some others we’ve created for topics and places of interest to our family! We like to focus on things that are free or low-cost, and that focus on hands-on or life learning over textbooks. Assateague, Md., and Chincoteague, Va. I hope you’ll check them out and let me know what you’re learning about! This entry is about books, chemistry, movies, science, unit study. The previous post was A new way for us to build: Making planes, robots and more with BionicBlox (now called Brackitz). 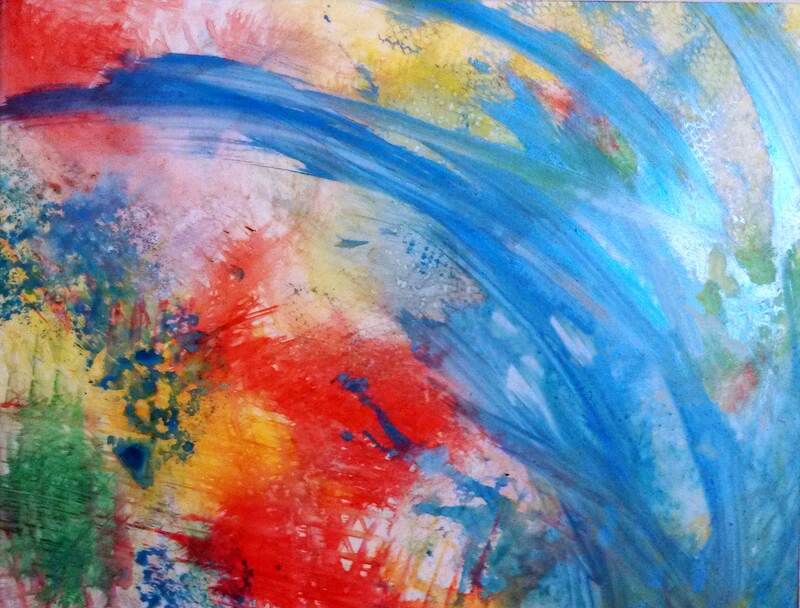 The next post is The power of words: Unschooling language arts. Okay, this is such an awesome post! Woo hoo! What excellent resources for being confident about teaching your child science! I am in love and am loving this post! 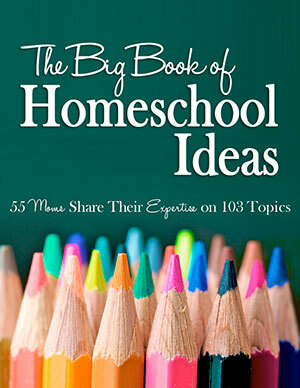 Thank you so much for linking this up at the #homeschoollinkup. I am pinning and sharing. 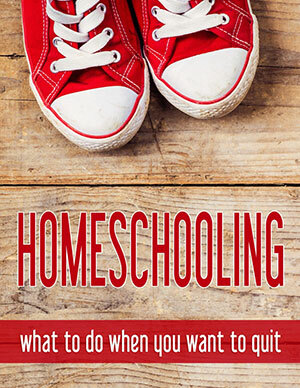 I know other homeschool parents will also love you as much as I do! I would certainly like to know more about that kickstarter program (not that I have $900 to give) but would be interested in what they are offering. Oh, this is a wonderful post. We have been light on science this year, but we plan to start into chemistry heavily starting in February. This will be a great resource for me. Thanks for sharing what you’ve been using. My son (who’s only 10) has always been fascinated with the periodic table of the elements, and I’m always on the lookout for ways he can learn even more. I’m bookmarking this post and thinking about what new books to buy. I also saw that Kickstarter and thought the same as you – sadly, no $900 windfall at our house either. This is an EXCELLENT resource list! Thanks for sharing it. Thank you! Thank you! Thank you! Super awesome! I have been searching for this kind of resource! I just pulled my 12 year old son out of school and he wants to focus on chemistry and math. He wants do do a math work book which is simple and cheap. ($3.50) but I know chemistry would be a challenge. I will be using everything I can from this that my son is interested in. I was concerned about the cost,so this helps a lot. Monica, SO glad we could help! There are just a ton of great free and low-cost resources out there; it does take some time to pull everything together, but you can definitely do it! Happy to have come across your post! My daughter and I read A Cartoon Guide to Chemistry and now she is looking for a good chemistry set! Unfortunately, the kickstarter kit is no longer available. Oh, bummer! I will definitely update to reflect that!